Bologna attraction-guides.com - Bologna, Italy attractions guide Bologna Giardini Margherita (Margherita Gardens), Viale Gozzadini information about attractions, chalet nightclub, history and landscaping, seating areas, location and address details, Viale Gozzadini, general tourist information about Margherita Gardens in Bologna area, Italy (Italia) IT - Last updated 30/10/2012. 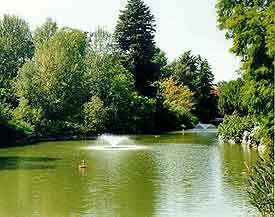 The Giardini Margherita (Margherita Gardens) are the main park in Bologna, providing the ideal place to relax and escape from busy Bologna city life. Bologna's Giardini Margherita (Margherita Gardens) date back to 1875 and there are always plenty of things to see and enjoy, such as a forested area, avenues lined with trees, pathways with many secluded places to sit relax, a small lake and a chalet, which transforms into a busy nightclub in the evenings. The Giardini Margherita (Margherita Gardens) have been a popular place for both visitors and locals for more than 100 years and many families visit the park during weekends in Bologna.